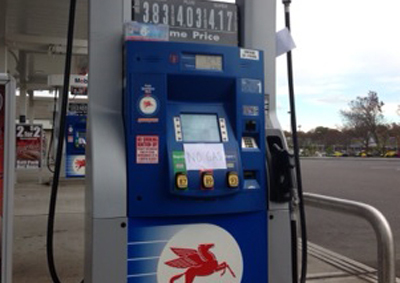 Long Islanders have been slammed with another crisis following Hurricane Sandy, a serious gas shortage. It may be days still before gas deliveries can be made to the Long Island gas stations that currently have power following Hurricane Sandy. According to Long Island Business News, the island’s major gasoline terminals in Lawrence, Inwood and Glenwood Landing are all without power, cutting off the supply for tanker trucks to make deliveries. The last major terminal in Holtsville has been exhausted of its supplies with the exception of diesel and heating oil. Suffolk County legislator Tom Cilmi says restoring power to the gasoline terminals should be a top priority for LIPA. “Gasoline is the lifeblood of our economy, particularly in Suffolk. With many gasoline stations out of service and those with power running out of gasoline, things could come to a grinding halt here very quickly,” Cilmi said in a statement. To be sure, the lines at the pumps in some cases have exceeding a mile in length, and some Long Islanders have reported waiting several hours to fill up. Finding an open gas station with a supply has been an added stress to recovering from Sandy’s devastation. LongIslandGasPrices.com continues to post updates on the island’s cheapest and most expensive stations. Suffolk County is now restricting the amount of gas residents can buy. Gas station operators have been advised to only allow customers to fill up one gas tank, and 10 extra gallons for those whose homes are still without power. Residents have been asked to restrict their gas consumption and stay close to home through the weekend. Until 11:59 p.m. Friday, the MTA will be providing free services which may help mitigate the current gas prices. Check our Post-Hurricane Guide for helpful resources in dealing with Sandy's aftermath. Subject: LongIsland.com - Your Name sent you Article details of "Serious Post-Sandy Gas Shortage on Long Island"